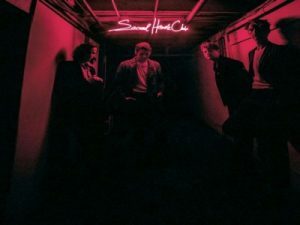 “Sit Next to Me” as the last promotional single of Foster the People’s third album Sacred Hearts Club.The song is about frontman Mark Foster trying to reach this girl, maybe an ex-lover, and setting things right by letting the relationship flow naturally between the pair. The official video for "Sit Next to Me" was directed by Fourclops and Brinton Bryan and was released on November 10, 2017. The video features 100 posts from Instagram influencers and celebrities and also includes submissions from Foster the People fans all over the world. "It was fun to play with the premise of a music video that hijacks your social feed," said director Fourclops in a prepared statement. "Instagram is a major destination for consuming media these days, and it made for an exciting setting for our video. We asked ourselves, what would it look like if all of the accounts within Instagram become transformed by a song?"